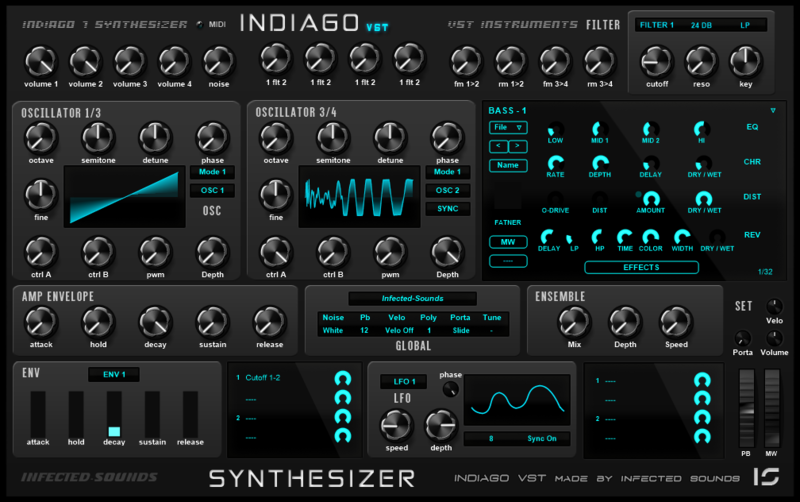 VST Instrument with sync FM and RM, 4 oscillators, contains 64 waveforms and 32 are from a famous synthesizer, also ctrl a and ctrl b mode and drive and depth, two waveforms are wavedraw oscs, it got 2 LFOs with phase and 22 shapes, also one 2 matrix, it got 2 mod envelopes, also an. amp envelope and it got 4 filter out 1 for each chanel and double filters, and there is 2 vowel filters, also there is an stepseq included, it got pitch bend and mod wheel, porta and one slide mode, Up to 16 voices polyphony, one main octave, bend range, velocity on/off, very handy for fast sounds, 99 Presets. ...und natürlich danke für den Synth!